All the storage you're ever going to need on your adventure! 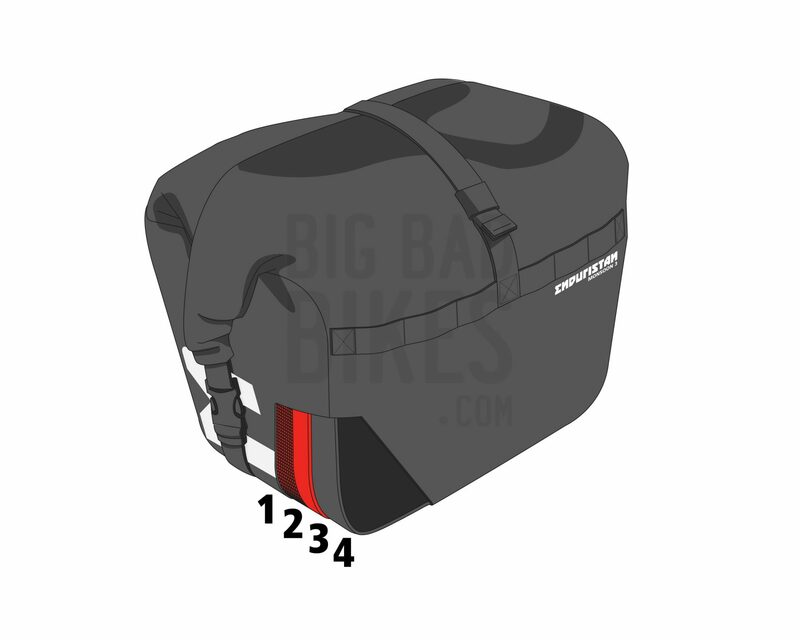 Enduristan brings you the Monsoon 3 saddlebag system. 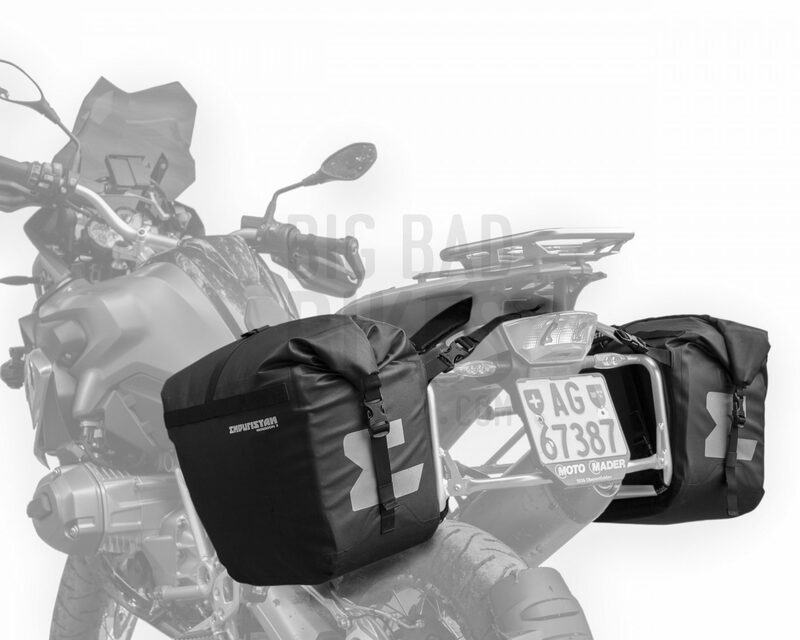 This is the latest iteration of the Monsoon saddlebags, and you can tell this from all the great features that Enduristan has worked into the new design. 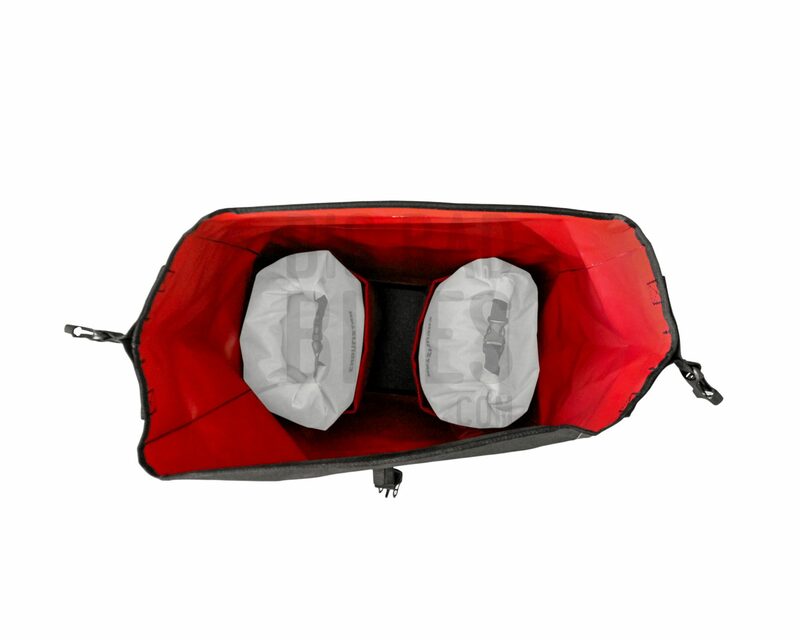 The bags are 100% water, dust, mud & snow proof. They feature a roll top closure which buckles down on either side, as well as a compression strap to ensure a secure closure. The compression strap can also be used to tighten the bag down on itself when it isn’t full. They provide up to 30 litres of storage capacity on each side. The bags have 2 rows of molle webbing each to attach other products on to them (such as other Tornado 2 drybags, the Base Pack XS etc). Layer 1 – WEAR PROTECTION – The outermost layer of the 3-layer fabric is made up of heavy duty polymer which acts as superior wear protection. With an all-welded design it makes the XS Base Pack even tougher. Layer 2 – TEAR PROTECTION – The middle layer consists of 1000D Nylon mesh which is densely woven yet flexible to allow the 1000D Nylon filaments to align in the direction of the stress. Layer 3 – WATER PROTECTION – The innermost layer of the 3-layer fabric is made out of red vinyl for perfect visibility and 100% waterproofing. Layer 4 – IMPACT PROTECTION – At the front, underneath and at the rear we have added a high impact plastic to protect the contents of your bags from loose gravel and surprise branches. The bags come with removable reinforcement panels. These make sure that the bags retain their shape even when empty. These reinforcement panels can be removed in case you want the bag to have less of a structure. 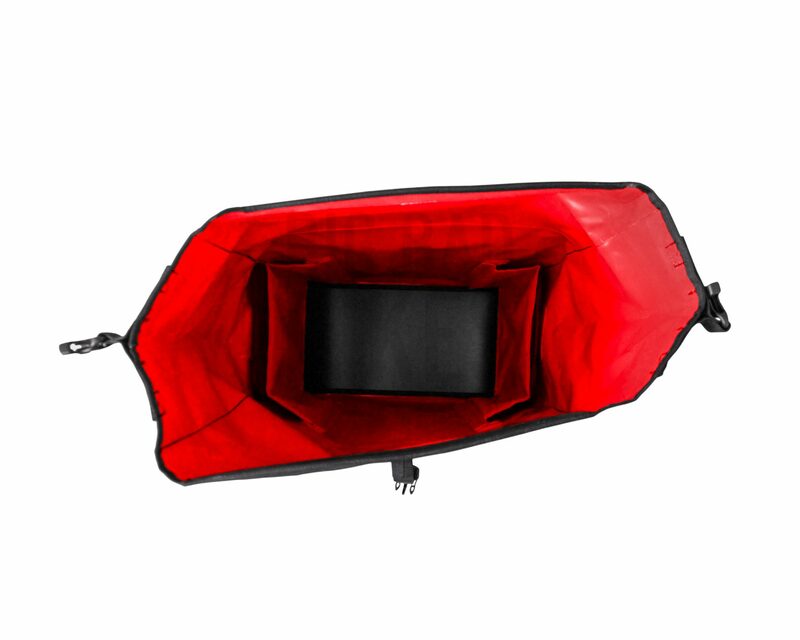 The inside of the bag has collapsible partition panels that can help to organise your luggage. The partitions work best when used along with Enduristan’s Isolation Bags. 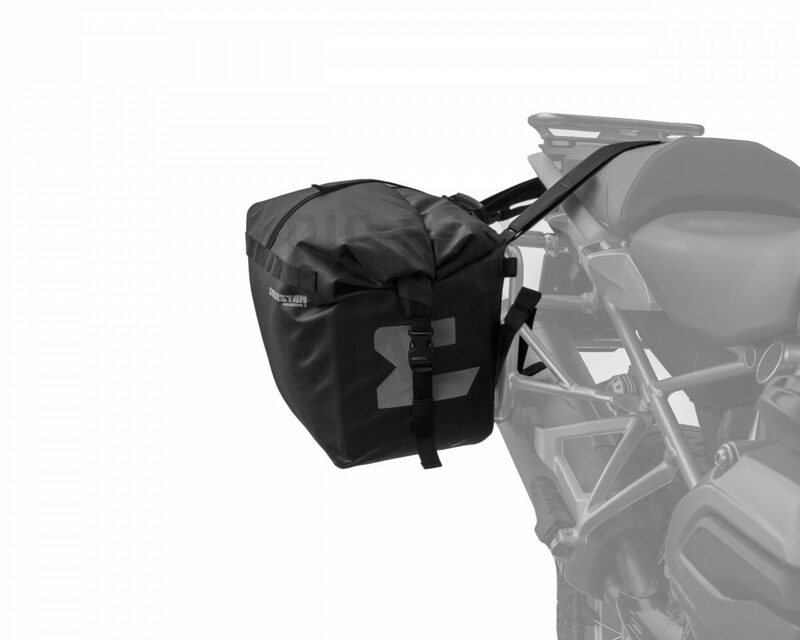 The bags mount to your bike using two heavy duty velcro straps that go over the bike (either over or under the seat, depending on the bike), and 2 additional straps per side – one at the front and one at the back – to hold the bags in place. 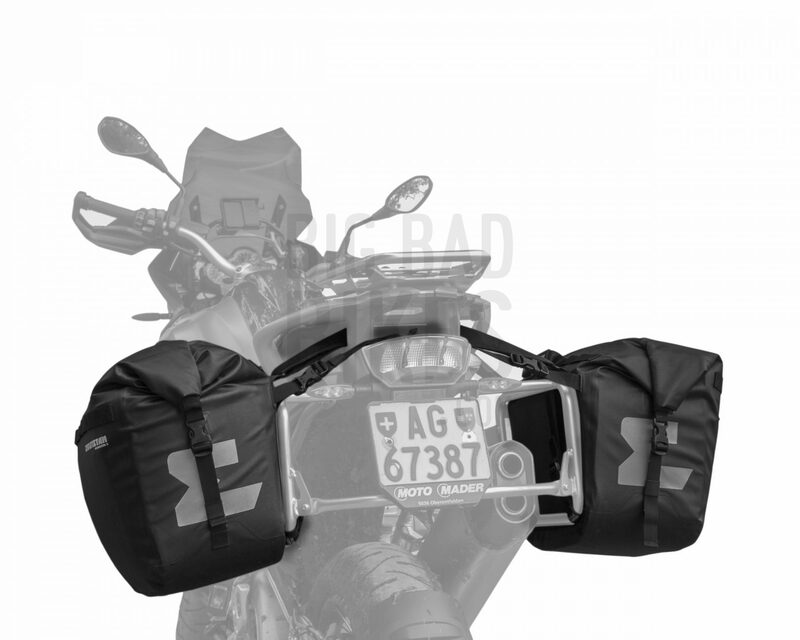 The main straps are adjustable and can provide anywhere from 210mm to 750mm of gap between the bags. Also included in this kit are an additional set of ROK straps to fit the Monsoon 3 to side carriers (see the video below). Each bag has a rubber handle so you can carry them easily when off the bike. The back of the bags have a rubberised surface that will reduce the amount of scratches against your bodywork, and will also provide some amount of grip. Please note though that this rubberised surface is not heat resistant and must not be place directly against the exhaust. You can use Enduristan’s Inferno Heat Shield to avoid this!